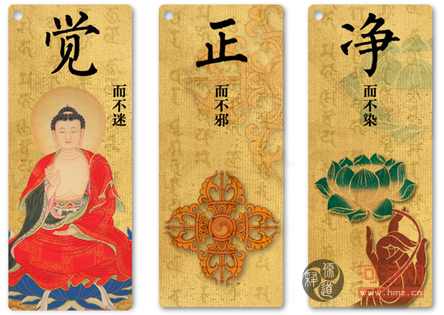 After learning that the Buddha possesses 5 eyes, which penetrate different levels of truth of this world, the Buddha explains how this penetration works. He explained, there are many worlds he sees, as numerous as the sands in the Ganges River, and there are many beings in each of these numerous worlds with different minds. 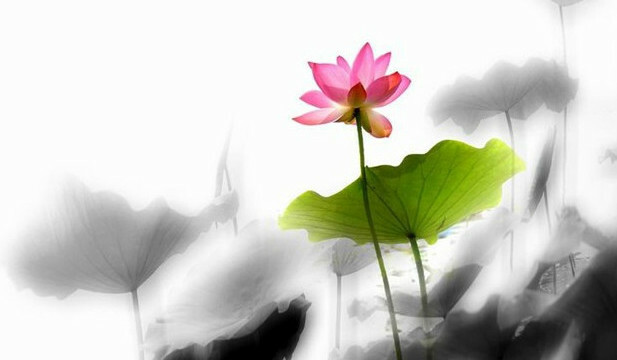 Yet, all these different minds in different worlds are known to the Buddha. How could it be possible? Does it sound familiar with the notion of omni-science (all knowing) in some of other major religions in the world? Not only did the Buddha described this from his subjective reality, he also explained that it (the penetration of truth) can be achieved when we transcend our mind, which habitually dwells on the concepts of the self, in the time frame of past or future, and on the concept or descriptions of the present (as suppose to the reality of the present). Therefore, the Buddha concluded: neither the past, the present nor the future mind can be found (can be used to find ultimate reality, or could be dwelled on as stable reality). The public aware mostly of their Human eyes, the curious are easily drawn to the Deva eyes, truth seekers cultivate their Wisdom eyes, the realized ones see with the Dharma eyes, those who continue on eventually perfects the Buddha eyes. We have learnt that there is no Buddha who “obtained” enlightenment, as enlightenment is beyond the notion of something that could be obtained by someone. 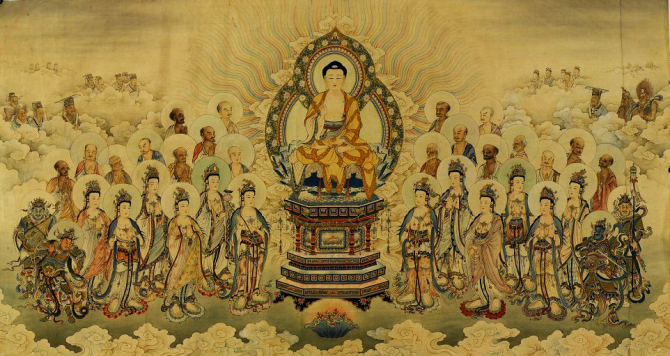 In this section the Buddha furthers that there is no Bodhisattva who could save any beings. Why? Because the notion of “Bodhisattva” is absence in a real Bodhisattva when carrying out his/her charity work (actually Bodhisattva is beyond and no limit to sexual differentiation). On the other hand, when one accepts the notion that “I shall liberate unlimited beings”, the notion of a self, others, world, and immortality arises and one falls into the realm of ego and mortality. Even in the worldly realm, we can see that real philanthropists choose to remain anonymous for a similar reason. Can we do charity work without the ego/self getting involved? The moment we succeed, the moment we are real Bodhisattva. 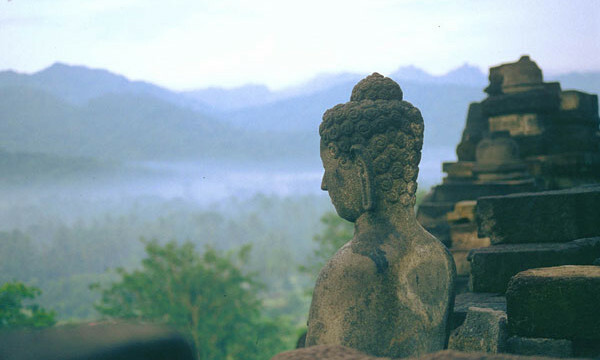 After learning how to set spiritual intention (beyond form) and how to pray (quieting our self), the Buddha reminded us through his own example that enlightenment could not be obtained (as it is beyond the dualistic paradigm of a separate someone who obtain a separate something), there is no teaching which leads one to enlightenment (the second level of surrender, see former post – the 2 stages of surrender), and enlightenment could neither be categorized by real or not real (it is beyond, yet inclusive of human language and description). 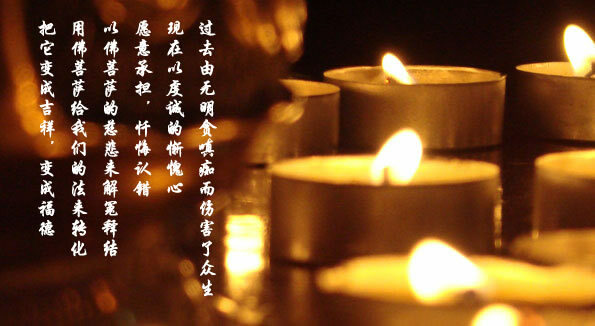 Then, the Buddha expound that as we surrender our self and orientate our life towards spiritual studies and devotion, everything becomes teaching to enlightenment (是故如来说：一切法皆是佛法。). Does it sound familiar with what Confucius said in our earlier blog (Confuscius Analects – there are teachers everywhere) ? And of course, to prevent our mind from quickly attaching itself to this new notion of “everything is teaching to enlightenment”, the Buddha immediately reminded us that this conclusion too is transitory and needs to be surrendered. So far, we have learnt the importance of setting our spiritual intention beyond form, and we also learnt the importance of not following the notions of a self, others, beings, and immortality in our practice. One may ask, without the notion of the self, how can we set our spiritual intention? Careful examination of one’s self reveals that the setting of spiritual intention is beyond the self, where the self merely claims credit of it soon after it happens. 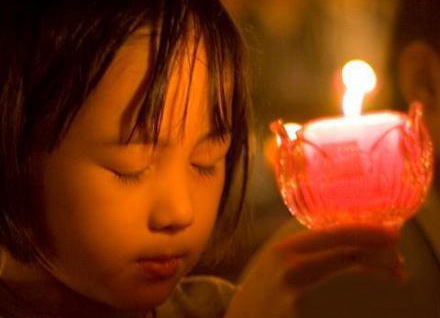 In a classic prayer, we would quiet our mind (in fact the entity that needs to be quieted is the self), and when the self is quite, there is communication, or reunion with our inner wisdom, our divine, or whatever we set faith in. Otherwise, it would become a “self-talk” which reinforce the notion of our “self”. Therefore, there is a difference between a prayer where our “self” pray to our faith, and a prayer where we put down our “self” in our faith. Note: Where the former would seemingly strengthened the self and the latter weaken, real surrender does NOT necessarily lead to either (the strengthening and weakening of the self), but instead embraces the possibility of both. Ponder on it. This chapter describes the process of letting go negative karma. From individual karma point of view, where everything we experience now is a consequence of our past actions and habits, the experience of attacks and insults from others are the results of our past actions and habits. If, at the moment of experiencing attacks/insults/unpleasant situation, we can center ourselves in the Truth of this Sutra, instead of resisting or fighting back to the situation, then the negative patterns will eventually run out and be dissolved. This is why the Buddha said aligning, integrating, and sharing of the Truth of this Sutra lead to the dissolving of our negative karma. The setting of spiritual intention, therefore, is the central core of spiritual cultivation. In this chapter, the Buddha explains that a Bodhisattva should set its intention beyond all form and all senses. If one set one’s intention and do charity with the notion of self and form, one enters into darkness, versus when one do charity without the notion of self and form, one enters into light. Why is it so? Because when we do charity work by the self, self-centerness is enforced which leads to the darkness of ignorance. On the other hand, if we surrender our attachments of and to our “self”, life expands and becomes increasingly clear as we follow the light of wisdom. Therefore, when we set and reinforce our intentions, remember not to fall into the traps of forms and self, and we will proceed broadly in the pathway to Truth. One day, when the Buddha was meditating as a Bodhisattva, king Kaliraja came test the Buddha. He said, ok, now you are practicing the 6 paramitas (charity, precepts, endurance, diligent, concentration, wisdom), let see how enduring and charitable you are! And he start cutting off Buddha’s limbs one by one. The Buddha did not resist, and let Kaliraja cut off his limbs one by one. Not only so, he declared that if Bodhisattva’s compassion is real, the body will resemble by itself. And instantaneously, the body resembled. How could it be so? In this section of the Sutra, the Buddha explained that at the moment of Kaliraja cutting off his limbs, in his awareness, there was no abiding in the false notion of self, others, beings and immortals (see early post Diamond Sutra – self, others, beings, immortals). Together with high level of practice in concentration and wisdom, the Buddha was not moved and therefore not affected during the test of disembodiment. Therefore, the Buddha explained that in real endurance, there is actually no “one” enduring any “thing/feeling”, and therefore there is no anger and hatred. In the Daoist tradition, Laozi also recommend transcending hatred over enduring hatred (see earlier post “Daodejing79 – Hatred meditate vs. not rising“. You may ask, did the Buddha feel the pain? In the process of transcendence, the feeling or sensation could still be there, but there is no “self” who get involved or participate in the process. Further to the earlier part of the Sutra “Buddha beyond form and appearance” and “There is no Buddha who attained enlightenment“, this chapter further describes that real Buddha cannot be recognized by its specific 32 characteristics in appearance, and that Buddha has not taught anything. 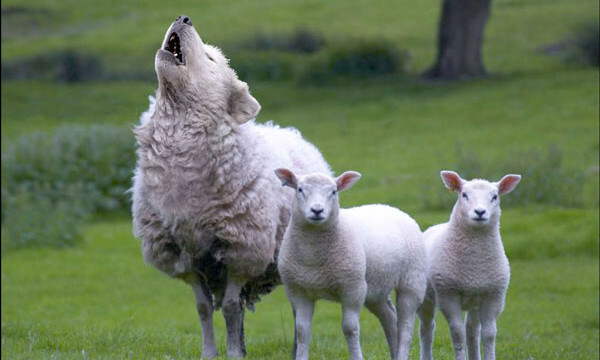 While some Buddhist scriptures describe Buddha to have 32 characteristics in appearance, it is also a well known scenario that whenever something genuine desired thing (like luxury goods) is known to the world, counterfeit appears as wolf covers in sheep’s clothes. Therefore, when we see a Buddha/Bodhisattva comes with matching characteristics of what the scripture describes, be extra cautous: it could be a genuine perception, or it could be a demon appearing to test you! 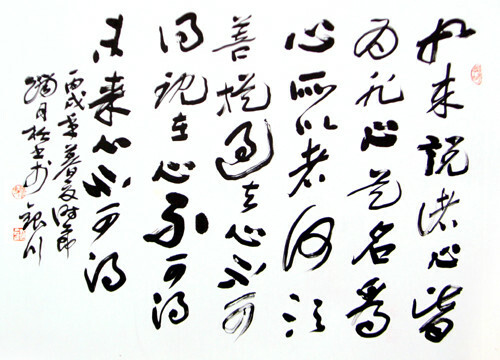 (refer to Chinese classic fiction – Journey to the West for some example of tests). The Buddha foresaw this and therefore warned us ahead of time not to fall prey to these unreal imagination and counterfeit. With 40+ years of teaching on earth, the Buddha has left with us many teachings perceived in sounds, words and languages. While sound, words and languages are convenient ways that help us improve and proceed towards truth, ultimate teachings is beyond words and no word, and is beyond the describable “something” that was transmitted between the physical Buddha and his students. 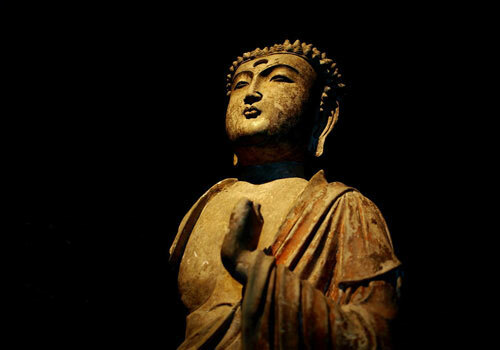 Therefore, from the absolute point of view, it is wrong to say that the Buddha had taught us anything, which imply a definable Buddha taught us some limited knowledge! Real truth is beyond words, and no-word.